Indian cosmetics market is right now estimated to be $950 million, which is all set to expand to $2.5 billion by 2020. More than 40% of the cosmetics sold in India are imported from other countries. In a decision which can have significant impact on this statistics in the coming days, Indian Government has banned all animal tested cosmetics product in the country. By doing so, India becomes the first country in South East Asia to have banned such products. On the contrary, Chinese laws says that any cosmetics products imported should be animal tested before being sold. Animal rights activists all over the country are rejoicing on this major decision; and are hoping that similar laws would be imposed on other Asian countries as well. This notification would be valid from November 13th, 2014. In June this year, Indian Government had banned the procedure of animal testing on cosmetic products, thereby sending shockwaves across the industry. Australia, Brazil, New Zealand, Taiwan, the United States, Israel and 27 other European countries have already placed a blanket ban on all cosmetics products which are animal tested. By joining this league of nations against animal cruelty, India has indeed set an example for other major Asian countries such as China and Japan, where such animal tested products are not only allowed, but ‘mandated’ by law. People for Ethical Treatment of Animals (PETA)’s India chapter have hailed this decision, and has termed this as a victory against animal cruelty. Several prominent social welfare organizations such as Humane Society International (India); PETA and others have been campaigning relentlessly against animal cruelty and testing of cosmetics products on animals since last few years. This decision by the Indian government is a victory for all those who helped to generated awareness and buzz about this issue. Will you be happy to know that your cosmetic product is now free from animal testing? Or will you worry about untested cosmetics products? 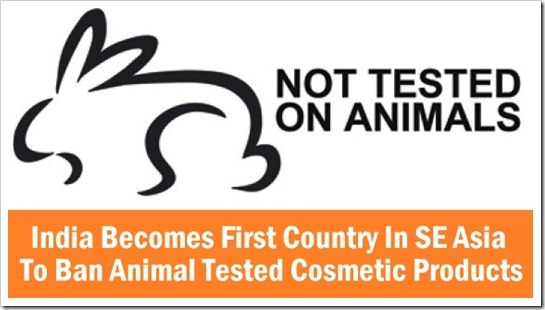 "India Becomes First Country In SE Asia To Ban Animal Tested Cosmetic Products", 5 out of 5 based on 1 ratings.